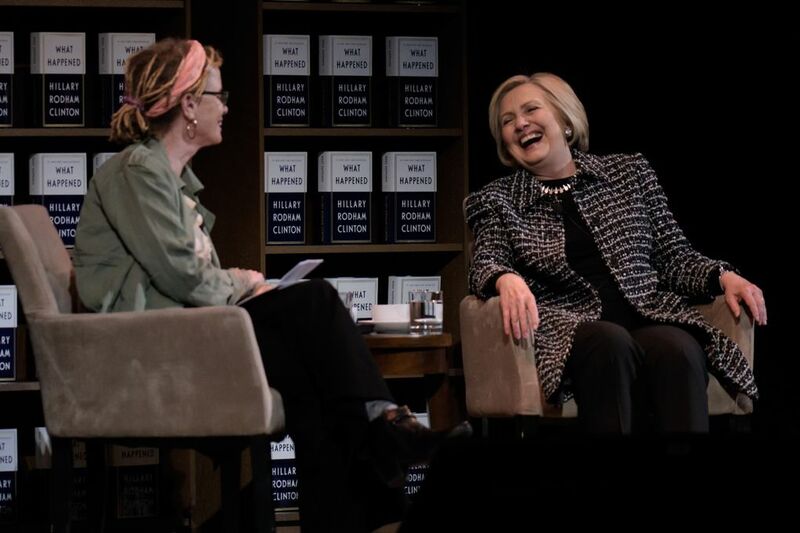 Hillary Clinton joined author Anne Lamott in a 90-minute conversation at the Paramount Theatre Monday, in support of Clinton's new book, "What Happened," about the 2016 election. 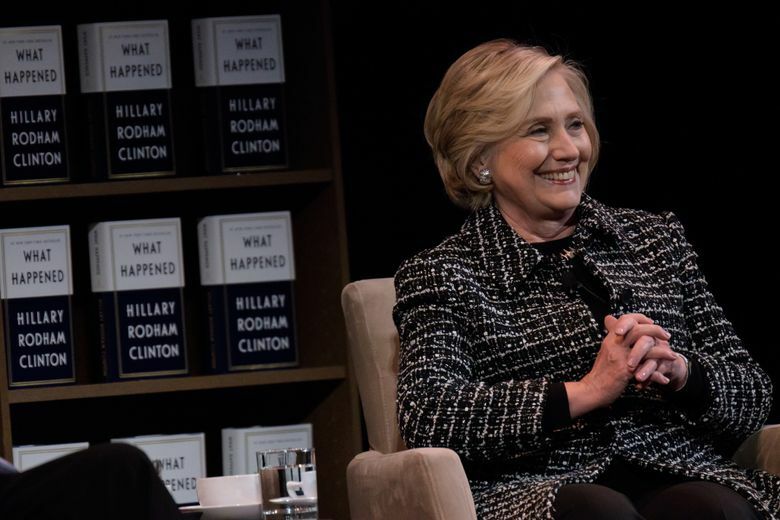 And so began a 90-minute conversation between Clinton and author Anne Lamott in support of Clinton’s new book, “What Happened,” about the 2016 election: how she was defeated by Donald Trump, what his election means to democracy and what people can learn and do in the wake of it all. Clinton walked out in a black-and-white jacket and pants to a sustained standing ovation. The cheering continued long after she sat down. In the time after the election, she said, there were times she wanted to pull the covers over her head. She read a lot of mysteries “because the bad guy gets it in the end,” watched a lot of HGTV and organized her closets. There were many things that worked against her last November, most notably sexism in politics, she said. The more professional men are, the more people like them, Clinton said. It’s not the same for women. She spoke of how Russian hackers planted ads on social media, influencing the results. There was massive voter suppression, she said. These are things European countries caught on to and that American voters need to be aware of, and to fight against — something Clinton plans to do from now on. The crowd — which paid between $155 and $646 to be there — was predominantly women, some of whom used walkers to get to their seats, and some who barely filled them, like 5-year-old Julianne Pedersen, who came up from California with her mother, Gina. Julianne wore a lavender pantsuit lined with Wonder Woman fabric and a string of pearls from her grandmother. Kaia McCready, 10, sat with her friend Willa Chin, 11. The two attended the Women’s March in Washington, D.C., last January with their mothers. They had been hoping to witness the inauguration of the first woman president. They came to see her here instead. But Clinton turned the conversation to the positives: The women who had gotten involved in politics since her defeat. The ongoing investigation into the Trump campaign. And while the Republican tax bill is “horrible,” she said (“It will explode the deficit and debt and inequality”), those who voted for it have nothing left to do but try to get re-elected. Thankfully, she said, we have laws that prevent that kind of rule. When Lamott asked what three significant things people can do, Clinton was warmer than most had ever seen her. She urged people to be compassionate, and recommended that they find friends and family members who can lift them up when they’re down. And never lose hope, she said. She recalled her mother’s childhood, when she was rejected by her parents and at 8 years old, was put on a train from Chicago to Los Angeles with her 5-year-old sister in tow to live with their grandparents, who also rejected them. But there were small kindnesses. Clinton’s mother had a teacher who gave her lunch every day. And when she was 14, she became a housekeeper for a family that allowed her to attend high school. “As I got older, I asked her how did she not become bitter and broken, mean and hateful,” Clinton said. “At every point, she said, someone showed her kindness. “So when I think about hope, I think about small acts of kindness,” she said. “That recognition of one another’s humanity. That sense of yes, we are all in this together. And that is the core of my hope.